18 cool things that happened in 2018! I keep saying this, but 2018 was the fastest year of my life! I feel like so much happened, I was playing catch up for the majority of it and while a lot of less cool things went on behind the scenes, I wanted to continue this yearly series and end 2018 on a high. So behold 18 cool things that happened in 2018. It's worth noting that a lot more deadly things happened this year and it was hard to whittle it down, so that's the sign of a good year wha! This is not a visual representation of my office, my desk, my anything ok bye. 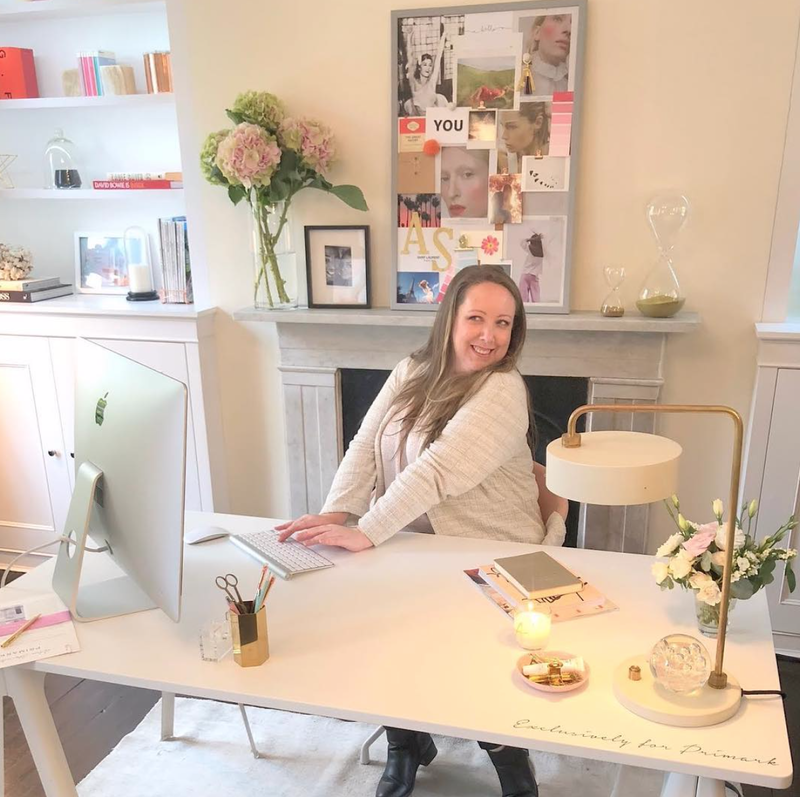 We all know my desk has never looked this good or styled or clean! This is the main cool thing that happened this year. And because of it, it was the best and the most stressful year of my life and something I'll go into in another post or video because freelance life is mad. Pure mad! My last two jobs were so regimented and full of routine and even a year later, I still feel guilty if I'm not sitting at my desk at 9am. I forget that I sometimes work until 10pm, but still, that mindset is sill proving tough to change, but I'm getting there. I have a lot more flexibility now, a lot less financial stability, but I've been challenged so much in terms of creativity and I still pinch myself as to how this hobby has turned into a job. The amount of support I've gotten this year from friends, people who follow me online, creative pals and mentors has been incredible, so I'm looking forward to seeing if I can make it work even better this coming year. 2. 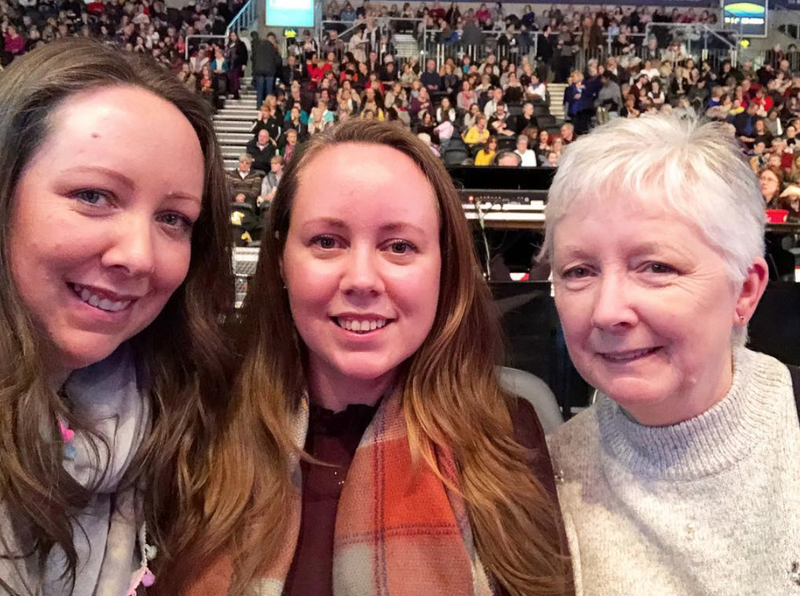 We went to the Strictly tour in Belfast! I think I put this in every year because it's one of my favourite things to do with Mam and Joanne. I'm raging that they're not bringing the Strictly tour back to Ireland this year, but for Christmas last year, I surprised the girdles with front row tickets to the show in Belfast. I figured I might as well treat them while I had the money! It's the best night out with all the sparkles and dancing and the absolute craic and I don't care what happens next year, we're going back to it no matter where they are. I feel like the show this year flew by and I didn't fully appreciate it, so next year, come September, don't be asking me to do anything on a Saturday night because I'm gonna appreciate the jaysis out of Strictly. 3. 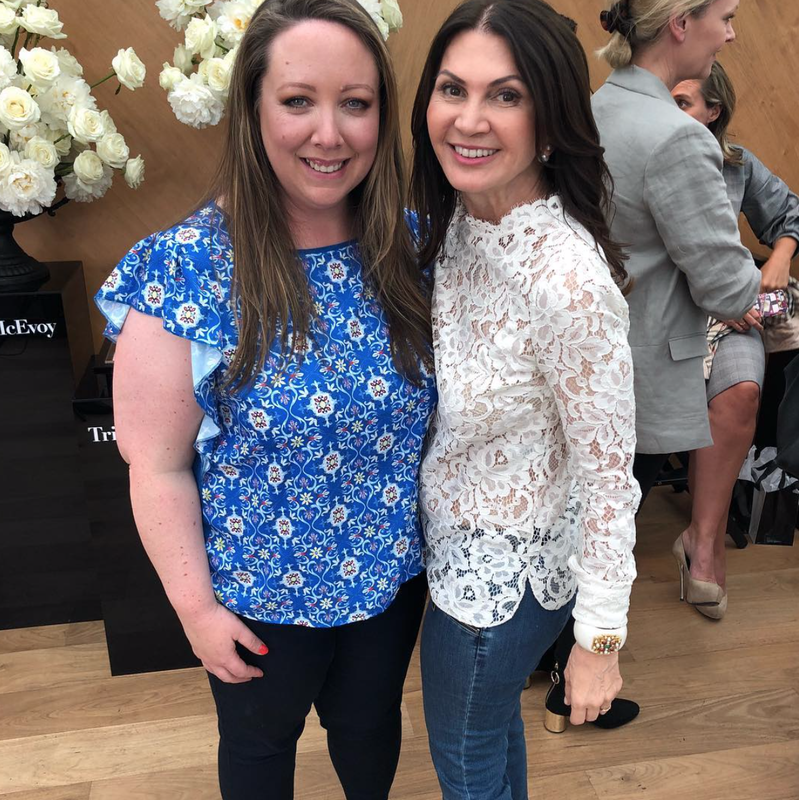 I went to London with Penneys and met Alex Steinherr! I took an Instastory of Alex and me and never saved it as I'm a thick, but sure listen, here's a lovely one of me and my pal Louise O'Reilly on the trip. I'm Louise's Instagram Husband when we're together at events and I love her loads! Yes, I was the closest I've ever been to puking on a bus due to the ridiculous travel sickness I get at the drop of a hat, but I had the best time over in London with a great group of women and I got to meet the gorgeous Alex Steinherr and hear all about her skincare collaboration in person. We'd so many laughs and I didn't puke. Those are the signs of a whopper trip if you ask me. Catherine and I took a notion last year to galavant off to the lavender fields in Provence during the summer and it was the best craic ever! Who'd have known meeting a gas bridie on the internet would lead to daily chats full of dirty memes, inspiration, advice, brainstorming and a gas holiday! We got to stay in the L'Occitane Hotel one of the nights which was just incredible and the perfect ending to a whopper few days. We had so many laughs, lots of which didn't make Instastories and I can't wait for our next trip. It's in the planning stages, so stay tuned! 5. I learned loads. I mean LOADS! Eight years into this blogging (now content creation) journey and I'm still learning so much all the time. I learned to say no to things that weren't a right fit for me and said no to people I felt were trying to take advantage of me. I said yes to things that were totally out of my comfort zone. Now I allowed fear to take hold a lot, which is something I'm working on, but I also learned that I'm capable of feckin deadly things despite the amount of self doubt that creeps up every day. I could do a post on this itself I tell ya and maybe I will sure. This self employment thing is, as Aladdin said, a whole new world, and while I've learned loads about it, I've learned even more about myself. Ok that's very deep and meaningful altogether! 6. I did a bit of presenting with Catherine for L'Occitane! This was something that was totally out of our comfort zone, letting someone else film us, tell us what to say and edit, because Catherine and I are usually in control of everything when we're doing our own videos. But we did it and I'm so glad I got to do something new, terrifying and exciting, with my pal and for a brand I love so much. Lads, we had cue cards and a telly prompter.... Verdy fancy! 7. 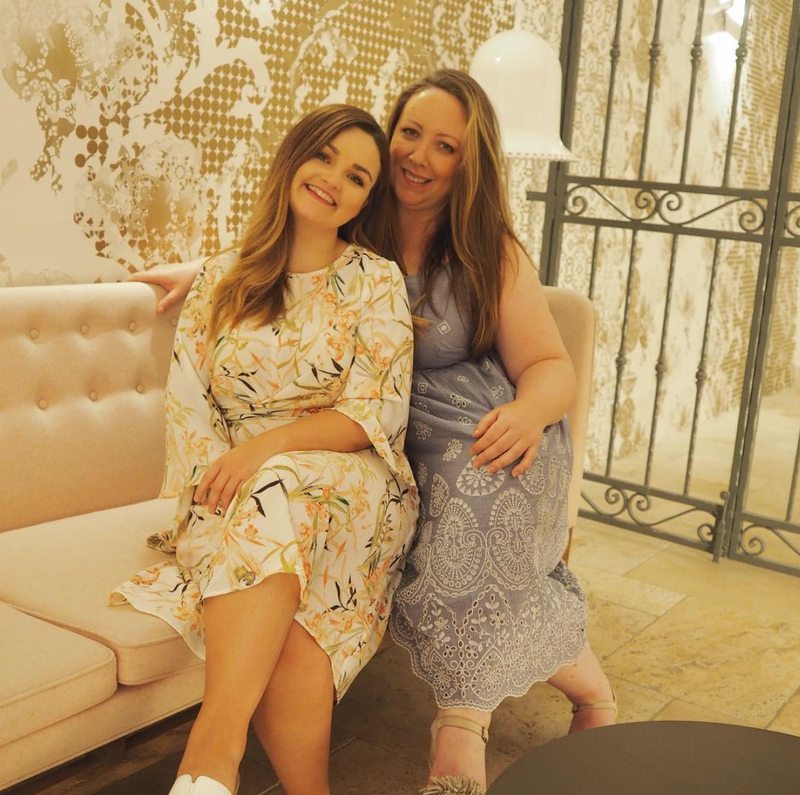 I stayed in the Shelbourne with Kerastase! I'm still not over this.... To celebrate the launch of the new Elixir Ultime oils from Kerastase, I got my hair done in Zeba using the new products (we won't talk about how I spilled Prosecco all over the floor with my pal Niamh), I had the most beautiful dinner where I didn't spill a single thing on myself, and slept in the Shelbourne. I've gone for afternoon tea in the Shelbourne with Mam and Joanne a few times over the years but have never slept there so that's one thing ticked off the bucket list! I've been using the Kerastase products since then and whenever I whip them out, I always think how lucky I was to get to do that. 8. I got instant highlights! 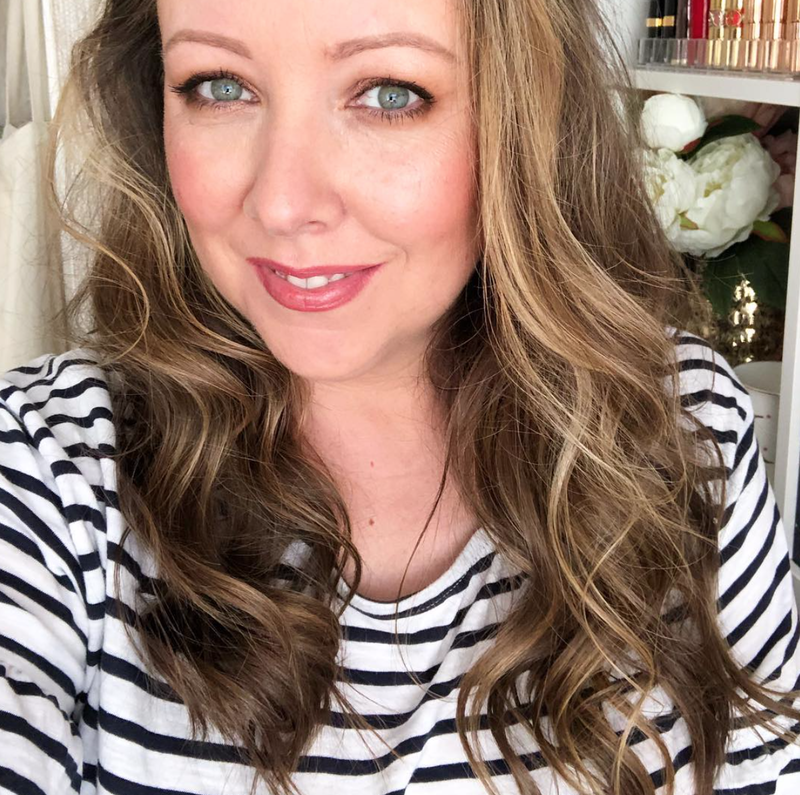 Still on the hair theme, back in April, I was invited in to get the Instant Highlights with L'Oreal and little did I know how much they'd transform my hair, my face, my everything! 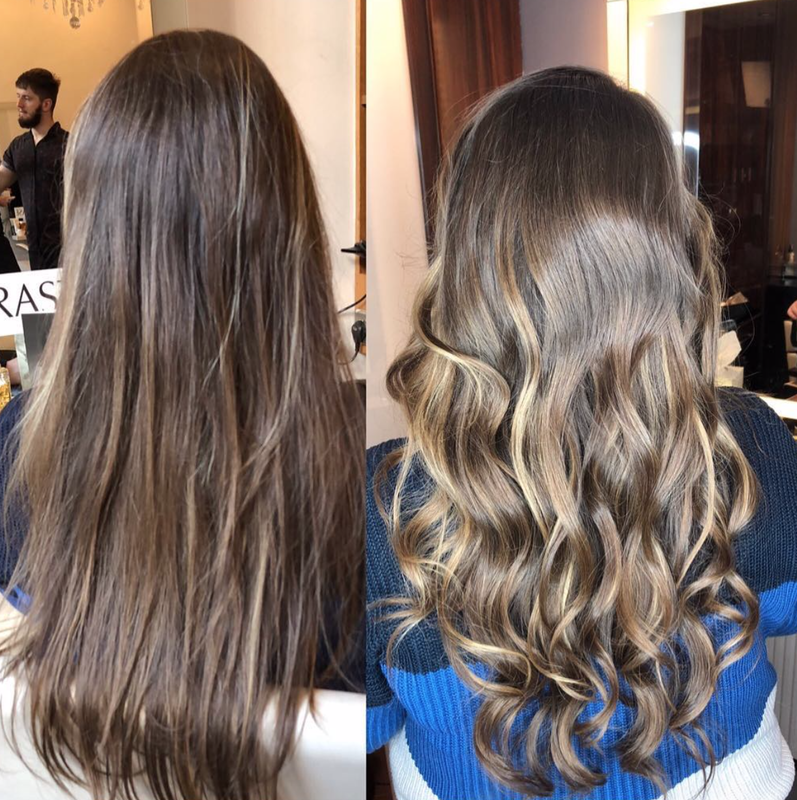 I'm going to get the mop chopped in the new year and will be getting the highlights again because I loved how natural they looked, and when I went to Spain shortly after getting them done, they lightened even more and I was obsessed. 9. I pinched myself with my Urban Decay Naked Cherry palette! I'm putting this as a cool thing because it showed me at my truest form - making a dirty looking eject out of myself and it gave a lot of people a laugh! 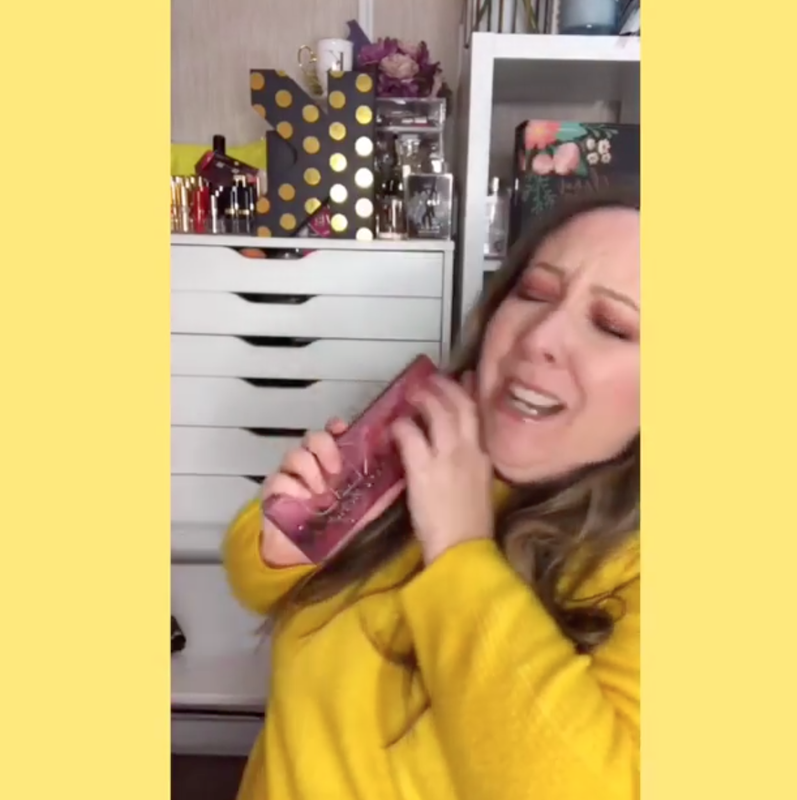 I hold things to my face all the time in videos and have been doing that for years, but this is the first time a product has hit back! I spend hours a month filming and editing those one minute videos for Instagram and of course this is the video that performed the best, typical! You can watch it here in all its glory and save it for days where you need to watch a 42 year old thick in action! My aim with my corner of the internet is to tell you about beauty products, but also to give you a giggle and distract you from any crap going on in your life and I think I did that this year. 10. 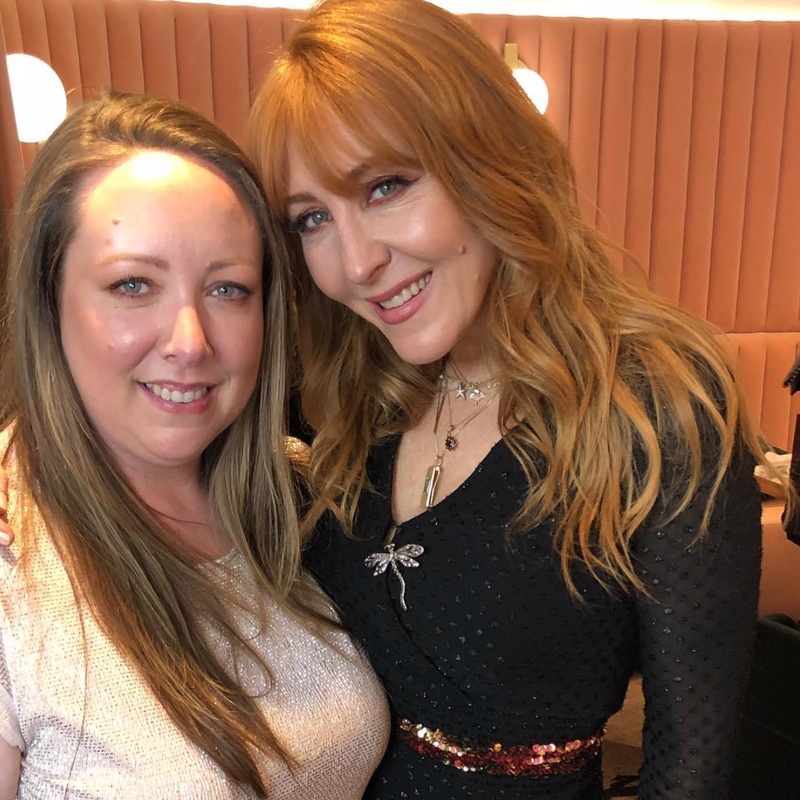 I met Charlotte Tilbury again! I just love Charlotte and think she's gas, and what's even more gas is a room full of fangirls with press and influencers all losing their mind! She totally does the whole "Darling" thing and I feckin love it. And despite being sent bits to play with, I still buy my own Tilbury products during the year so I do. For the most part, I love the products and I must do a video on my hits and misses from the brand. 11. I started doing 1 minute Instagram videos! I'm a huge fan of one minute makeup videos on Instagram, but found there was nobody doing makeup that I could do myself. I don't have much skill when it comes to cut creases and winged liner, I don't bake my concealer or use both cream and powder contour, and I don't really wear false lashes. Now I love watching videos where people do those things, but it's just not what I wear on a daily basis, so I figured I would show people how I use the same eyeshadows in each look no matter what eyeshadow palette I have, I show what the products are like applied with no filter and just show that you don't have to have any skills to look half decent after applying your makeup! I love doing them and plan to keep em going next year. 12. I upped my photography game! I've had my Olympus Pen EPL7 (the don't make this anymore, the EPL8 is the nearest to it) for two years now and it's taken me until the second half of this year to learn how to use the settings and take it off auto! I know I have an eye for product shots and I want to expand my skills next year and go outside of beauty, but in 2018, I did stop motions, cinemagraphs, took shots for brands, had my photos featured in Stellar magazine and in 2019, I'm going to go beyond that. It's something I'm so passionate about and I'll keep doing behind the scenes on Instastories so you can see how my brain works! One of my goals for next year is to learn even more and invest in more equipment, to upskill and to practice taking photos of all the things! 13. I met Trish McEvoy! I go to a lot of events. Probably too many to be honest, but when Trish McEvoy came over to Ireland, I'd no idea how different this event would be. Trish was fabulous, so witty and empowering and while she showed us her products in action, we went around the room and everyone spoke about what they'd done over the last 12 months. Of course I went into panic mode because I always get so nervous speaking in front of a crowd, but it was so lovely because I knew most of the ladies in the room, having met them at events over the years, but we never really got to have proper chats. It was great hearing what everyone had been up to and we all opened up about things we were going through and I came away feeling really uplifted and positive. So I can't wait for her to come back next year! 14. I looked like a lady at the Image awards! 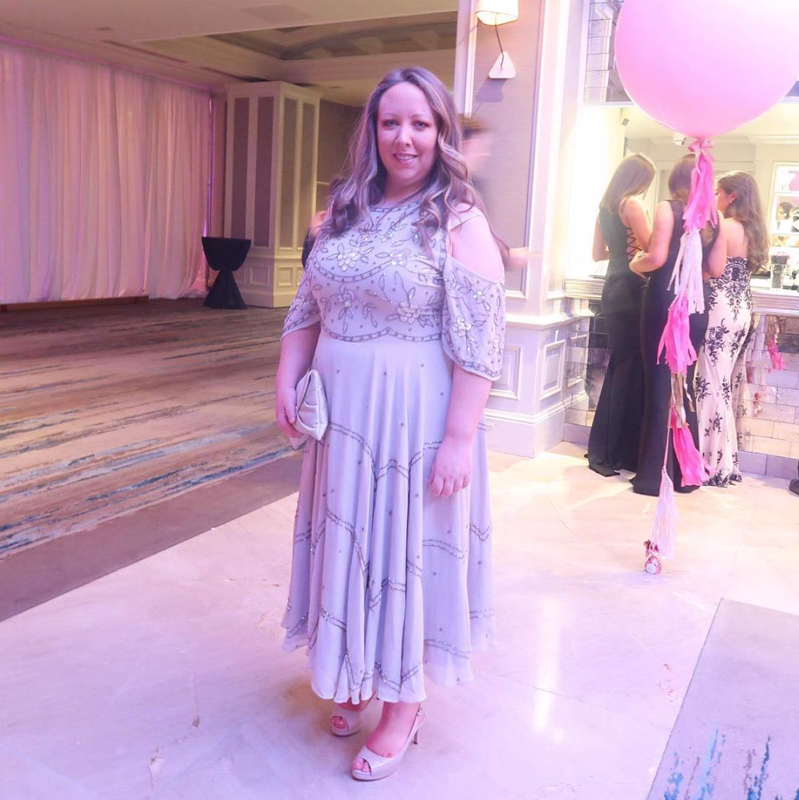 You know me, I'm all about that hun bun and fleece life, but going to the Business of Beauty awards means I need to embrace the glitz and the glam of it all! So I wore a dress I'd bought the year before on Asos and hoped it would fit, I curled my hair and again, didn't spill anything down myself. Result. 15. I worked in The Loop in the airport! This was a true pinch me moment, getting to work in The Loop in Dublin Airport for an afternoon. I've always wanted to work in the airport and I know 100% my Dad was looking down on me that day thinking it was verdy cool altogether. He loved the airport and we'd always have to be there a good 3 hours before our flight so he could soak up the atmosphere, so he'd have gotten great craic out of me doing my thing there. And it was so fitting because wandering around The Loop means that my holidays have started, so we always factor in time for said wandering when heading away! 16. I got to know some gas bridies even more! I'm not going to start naming names or else I'll forget someone and there'll be killings! But 2018 was the year I got to know some deadly pals even more. These are the bridies who make me cry laughing every time I sit beside them at events, they're the ones who I nearly end up fighting with because they're too kind and give me lifts home despite them living miles away. They're the ones who grab my bum at events and we have no photographic evidence of being together because we don't even think of the phones when we're having the chats. They're the ones I go for a cheeky McDonalds with after being at a fancy event, and the ones I stand on the street with for aaaages after leaving an event and saying I'm too tired to go for a drink. They're the ones who've been my advisors, my shoulders to cry on and who I've celebrated those little milestones with. They're the ones who I knew from one side of the blogging industry and now get to work with them on the other side of it and have listened to Christmas songs with since August. They're the ones who interact with my content (little in joke there! ), who I sat beside on a plane and snorted with laughter like never before, they're the ones who when I hear the music from Magic Mike, I see them lying on the ground in France doing their bits and they're the ones who inspire me, who make me want to work harder and who I wish that 2019 is going to be a deadly year for. 17. I did some whopper collabs! At the start of 2018, I wrote down a list of brands I wanted to work with and some of them happened! Next year I'll be doing the same, but will keep going back to the list because I kept forgetting who was on it this year. Shurrup yew, I'm old! I like to try and do something deadly with my collabs and test my creativity and I'm really proud of what I did this year. I poured my guts into each job, making them entertaining, informative and helpful for those having a look at them. The support on those jobs has never and will never go unnoticed and while me getting paid to work is a good thing(!) but it also gives me the financial freedom to create a load of unpaid content for you to enjoy. If I can pay my bills and go travelling a bit (and get photo props), that'll do me. The rest is the cherry on top. 18. I reached 8 years of blogging! I still think it's mad that I'm doing this since 2010. It feels like a lifetime ago and yet it's flown by. But I can safely say that starting this blog is the best thing I've ever done. I've found something I'm good at, I've learned some new skills, I've met incredible people and gotten to do the maddest things! I never ever take it for granted that I've found something I love so much because I know for some people it can be hard trying new things to see what you enjoy, so I know I'm lucky. I've also worked hard to get here and while it's nowhere near a job like a doctor or a teacher, my little corner of the internet is where people come if they want a distraction from stuff going on in their lives, if they want to see what mascara they should try out next, or if they want to look at pretty product photography! It's something I'm incredibly proud of and I think that's pretty cool! And thus ends this year's cool things wot happened this year! I can't wait to get stuck into 2019 lads. Thank you for all the support, the interaction, the chats, the laughs, the errthang. Yizzer deadly so yiz are. 11 fab fragrances for Christmas! Perfumes are the business. That is an actual fact. I love finding new ones to fall in love with and I finding old ones where the scent can instantly bring me back to a certain time in my life. It's one of the things I had in common with my Dad, our love of scents. Buying a perfume for someone for Christmas can be tough, especially with the sheer number of them out at the moment, but hopefully this post can help you whittle it down a bit. And I'm not putting links in because I'm afraid time will run out for you before Christmas, so your best bet is to go visit the shops themselves! Jo Malone Mimosa & Cardamom is very possibly my favourite scent at the moment, with this being my third bottle in the last 12 months. I love it. It smells powdery, soft, clean and every time I wear it, someone always asks what it is. I keep a bottle in my handbag at all times and nothing gives me greater happiness than to spray it on people (with their permission obvs) and the girls at work are always saying to me not to waste it! But my logic is that I want to share the scent with people and have them smell like it and be all ridey! 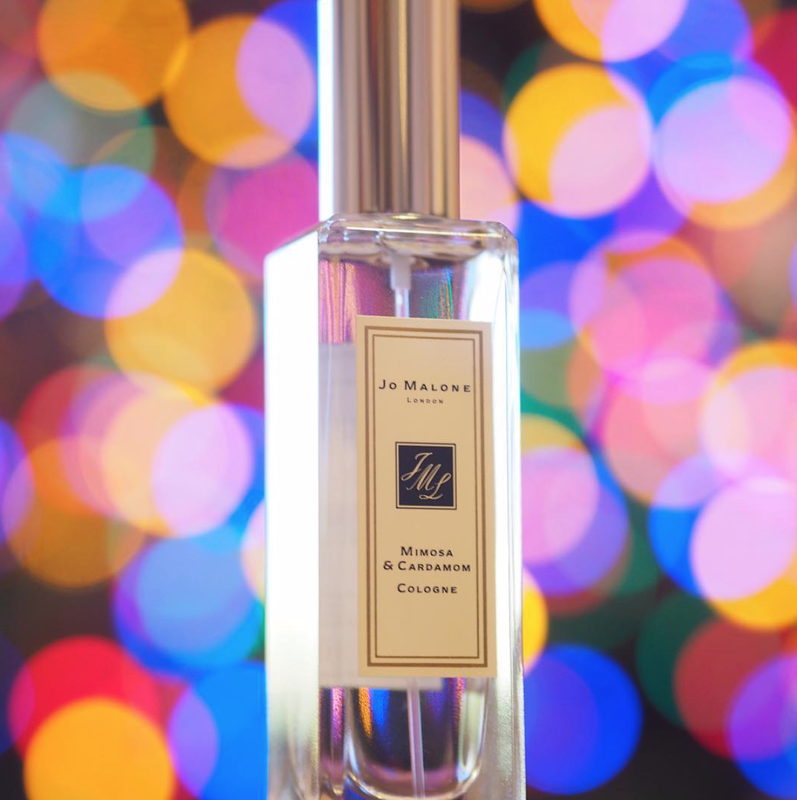 It's not a scent I every would have checked out in Jo Malone, just because the name doesn't sound like smells I'd ever go for, but after smelling it on Trish from Waxperts last year, I was hooked and since then, I've hooked lots of others on it too. As you can see, the lid from my Terre De Lumiere is long gone, but sure listen, be grand! I have a big bottle and a smaller bottle that I switch between and I still love how this smells, nearly two years after it being launched. With notes of amber, pink pepper, lavender and honey, along with tonka bean and acacia, this is a really comforting scent that's inspired by golden hour in Provence. It's creamy, smells good enough to eat (don't eat it) and you can get the perfume on its own or in a gift set in L'Occitane. This is a lighter version of the above fragrance, being inspired by Provence at first light. They've a more intense Terre De Lumiere as well that's inspired by Provence at night, so I'm literally just missing a version that's inspired by Provence during the day where the sweat is pumping out of you as you frolic in the lavender fields being attacked by helicopter bee things. Terre De Lumiere L'Eau is for those who love a lighter, more floral scent and is more delicate than the original with notes of bergamot, pink pepper and blackcurrant along with pink peony, bitter almond essence, tonka bean and white musk. It's a beautiful daytime scent and I haven't lost the lid. Yas! I was reading the description of Bonbon and it said "She who wears Bonbon, dresses herself in perfume while creating her own story" and it made me think, does she also dress herself in a cosy fleece and have her hun bun sitting atop her head at a 45 degree angle? I think not. This is fruity with top notes of mandarin, orange and peach, a heart of caramel, jasmine and orange blossom and a base of cedarwood, guaiac wood, sandalwood and amber. If you like Flowerbomb, chances are you're going to love this because it's intense, heady and not for the faint hearted. It smacks you upside the head with the sweet woodieness and is a lovely winter scent. Tiffany & Co Intense smells like it's the only thing I'll ever be able to afford from that brand. Ah no, it definitely smells expensive, like a fancy perfume your Mam would love. And mine does. When this arrived, she was like ooh what's that, had a whiff and kept giving it The Side Eye Of Love, so now that I've taken photos of it, it's all hers. It's floral and musky with notes of pink peppercorn, iris and amber and it comes in a beautiful Tiffany Blue box and sure who wouldn't want something from them? I'm just not fancy enough to wear this and that's ok. The packaging of Black Opium was made for the Christmas twinkles! But that's where the lightness ends, because this is dark and mysterious, like my good self and has top notes of coffee, also like my good self. It has a heart of white florals and a base of vanilla and is a cosy wintery scent, perfect for evening time when you're out galavanting. If you love your perfumes intense, you're going to enjoy this one. Keep your eye out for the clicky pen version of this scent that's perfect for your handbag and you can brush the scent onto your bits. Obsessed! At Christmas, you're allowed to wear all the glitter on your eyes, you're encouraged to wear all the sequins and 'tis the season to be sparkly, so why shouldn't your bottle of perfume get all glammed up too? La Vie Est Belle is ready for the party season with her twinkly new outfit so if you know of someone who loves the fragrance already and needs a refill, this is the ideal gift. This has top notes of pear and blackberry, a floral heart of iris, orange blossom and jasmine sambac, and a base of patchouli essence and if you haven't smelled this yet, you're probably the only person in the world who hasn't. Julia Roberts is raging at you don't ya know. Marc Jacobs Daisy was one of my first ever fancy perfumes and Daisy Love gives me all of the feels too. If you have the original, then you're totally still allowed to buy this one because it's different enough. This has top notes of crystallised cloudberries (not a notion what a cloudberry is and why it needs to be crystallised. How does one crystallise something? ), it has a heart of daisy tree petals (are daisy trees the ones with the round tops? I need to learn my plants) and a base of cashmere, musk and driftwood. I know what they are. Phew. This scent just makes me happy, and makes me smile. There's something so nostalgic about it but it's got its own vibe and also it makes me sing Daisy Love to the tune of Baby Love by Diana Ross. 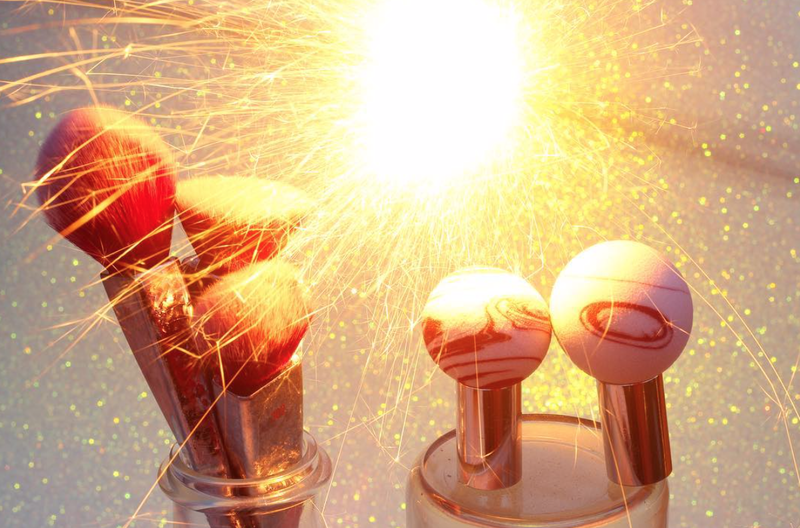 So do you actually need to know how to pronounce who made your perfume? I can have a go at saying Proenza Schouler but I'm afraid I'll end up sounding like those who can't pronounce Givenchy properly... I know. Sure listen, be grand. Arizona is a beautiful scent that's unlike anything else in my collection with notes of white cactus flower and jasmine and orange flower which gives me all of the floral feels before the heart of musk and cashmeran woods takes over. I've no idea what cashmeran woods are, but if this is what Arizona smells like, a place where I'd no intention of visiting in my life, then consider my mind changed. It's so beautiful, and has the perfect blend of powdery-ness and woodiness that I love in fragrances. I feel like a lady when I wear this and it's a fierce feminine and elegant scent. I am none of these things ok bye. Molton Brown never fails me, especially when it comes to Christmas. The Jasmine and Sun Rose range has that perfect blend of floral notes and sweetness, and is a really bright scent with top notes of raspberry, bergamot and peach, a heart of jasmine, osmanthus and rose and a heart of labdanum, patchouli and musk. Muddled Plum is more fruity than Jasmine and Sun Rose with top notes of orange, saffron and elemi, a heart of plum, davana and oak-aged rum and a base of sandalwood, benzoin and musk, making it both warm and sweet. Of the two, I definitely prefer the Jasmine and Sun Rose scent and have been using the shower gel of it as well this month. Molton Brown have a whole range surrounding both scents along with their regular favourites, so make sure to visit a store and try them out. That was a lot. I know. But I wanted to give you a load of options so feel free to screenshot whichever ones sound good to you and go try them in store. Happy scent shopping! Rituals Grafton Street - hello my new home! My love for Rituals has been going on for years now, with my first post being back in 2013 when I knew nothing about photography and used a fleece blanket as my backdrop! I'd been using the products before that, but that's when they first appeared on the blog. Little did I know it would grow into a full blown love affair with me wearing what's now known as the Ritual of Dao Bed & Body Mist on Joanne & Will's wedding day. Back then it was called the Yin Organic White Lotus & Yi Yi Ren, and even now when I smell it, it brings me back to that amazing day. 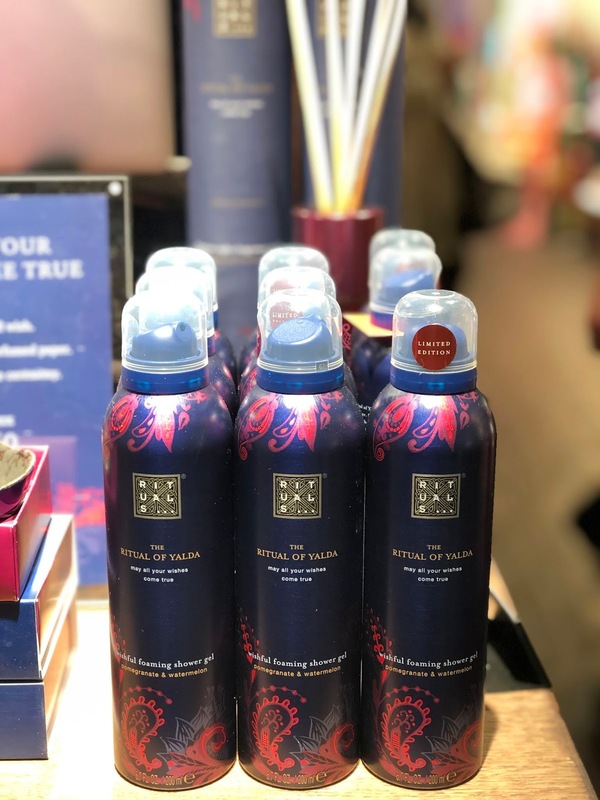 Anyway, if you missed my instastories last week, Rituals have opened up a stand alone store on Grafton Street and I went to the launch like a giddy child. Not many brands make me want to go to something when I don't know anyone going, but this brand just does something to me. And as they had us watching a video of how they want to make those daily routines into rituals, I could feel myself getting emotional and then mortified. But I love the ethos so much. We're all running around like lunatics every day getting all our bits done and we're not being present enough. 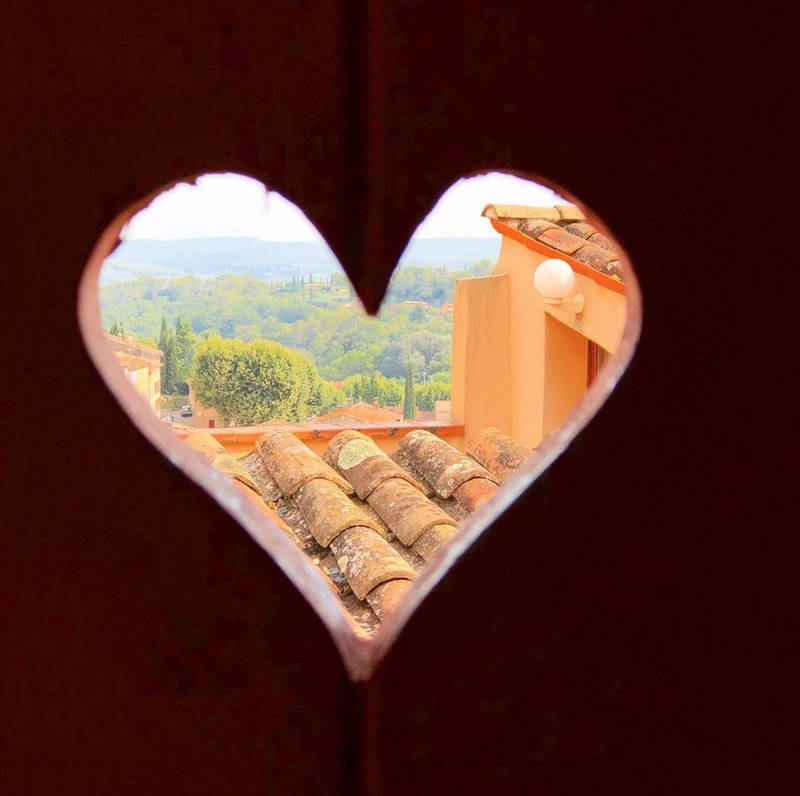 We don't allow a couple of moments every day to ourselves, be it in the shower, or applying our body mist, or lighting a candle for half an hour and just be. But I promise, if you find the right range for you in Rituals, it will be so much easier to enjoy the little things. I love the Ritual of Dao, which is calming and I ration myself with it because I don't want to lose that feeling it gives me when I use the products! I know that sounds mad, but sure listen! I took over 60 photos that night, so here are a few of my favourites. 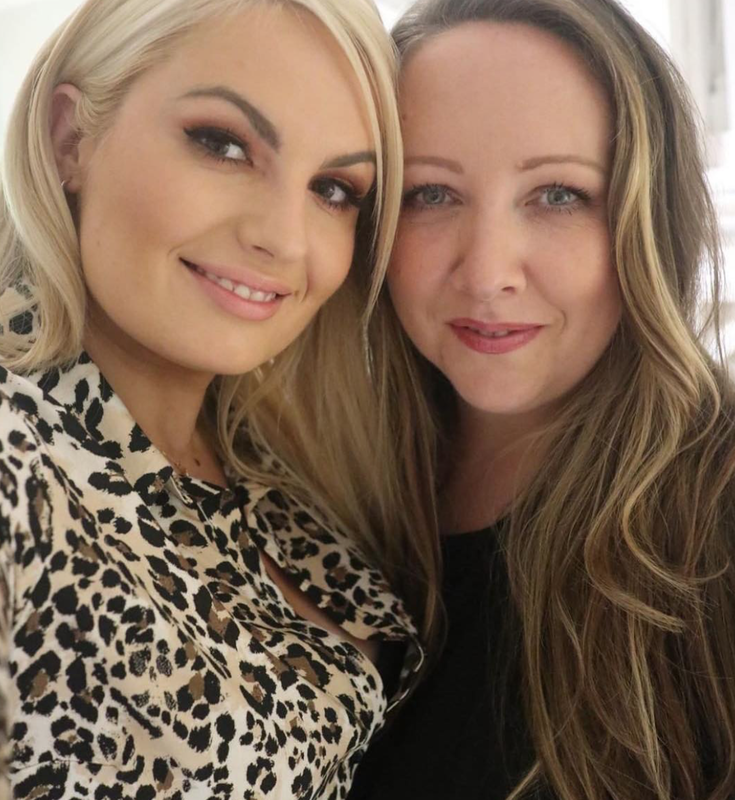 What I'd recommend is that you go into the shop on Grafton Street and give yourself some time to go through all of the ranges and find your favourite. 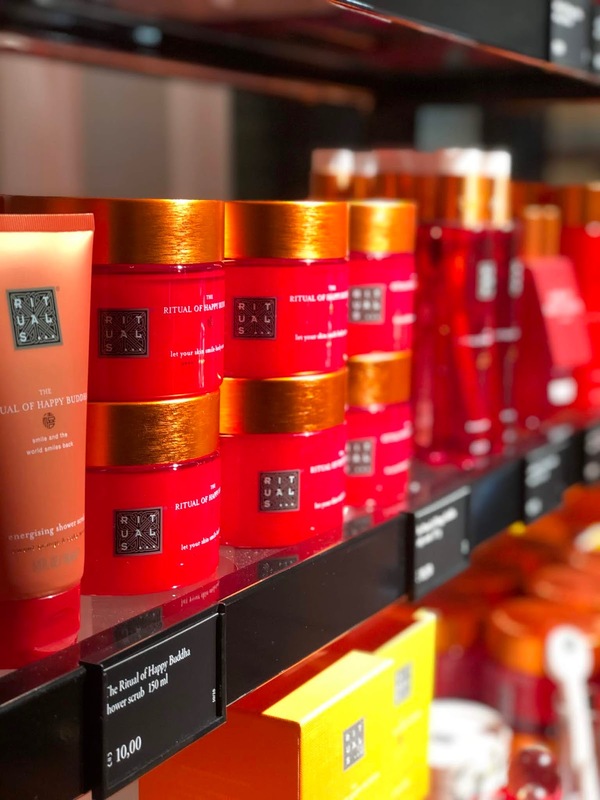 And if you can't get into a Rituals shop, you can buy the products online. Take your time and read through the descriptions of everything so you can get a feel for what the products might smell like. 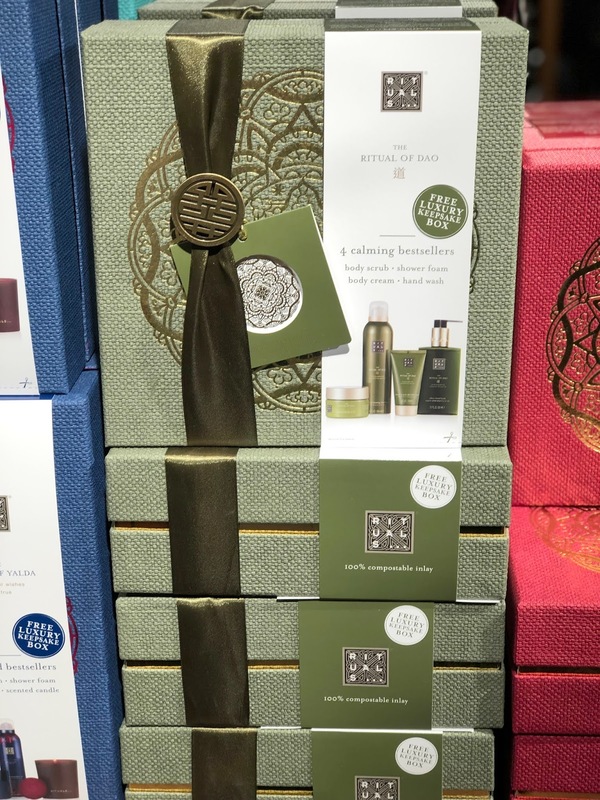 I've tried so many products from The Ritual of Dao, from the body products to the candles and diffusers, and there's something very soothing and comforting about this scent. It's mainly a floral scent thanks to the White Lotus, and coming up to Christmas, I'm going back to the shop and I'm going to get some of the products from the range that I haven't tried yet. They've lots of different gifts sets in this range depending on your budget, the same goes for all of the ranges, and can we take a second for the boxes... They're stunning and when you've taken the products out, you can use them for your bits and pieces. I feel like I need to try The Ritual of Happy Buddha these days as I'm wrecked all the time! Anything that will energise me eh? Another range I love and is next on my hit list to try is The Ritual of Hammam. It gives the feeling of purification thanks to rosemary and eucalyptus, and could be a good one the day after your Christmas party? Wash away any memories of the night before?! The Ritual of Sakura is said to make you feel like every day is a new beginning and that's something I'm totally on board with and try to do myself, so maybe trying some of these products would help make that a bit easier. This range has the scent of cherry blossom, one of my favourites, and I was this close to buying the diffuser of this recently before I knew the shop was opening, so it's on my list. The Ritual of Ayurveda is one I think I need in my life, promising to help start your day with inner harmony and to create a balancing effect. 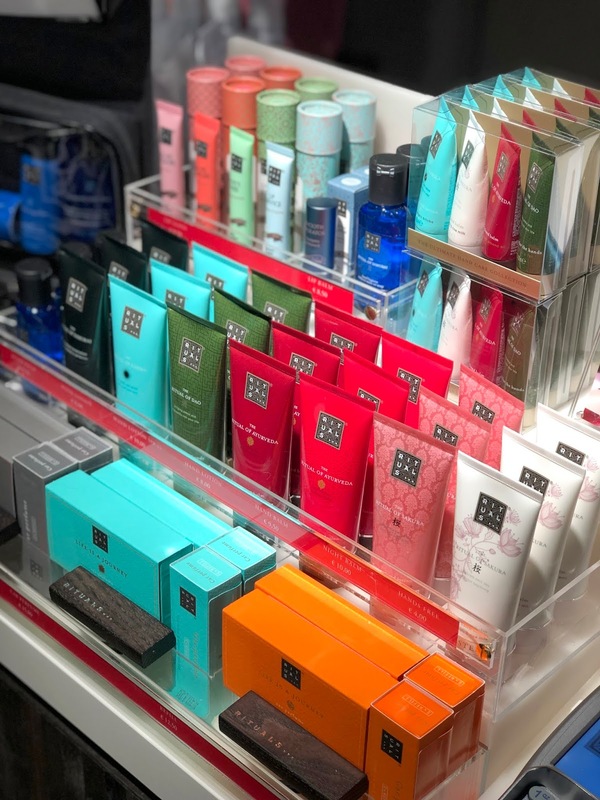 Yes please Rituals, yes please! The Ritual of Yalda is their Christmas range this year, promising to give you a boost of energy during the cold, dark days of winter. I'm going to need everything this range has to offer because the lack of light is killing me. Who else is struggling? I had no idea that Rituals had a makeup range, so you know I'll be investigating that next year when I learn a bit more about it. And I only found out they had skincare recently when I was at the counter in Arnotts, so that's also on the list to try. And like any good shop, they have a section right at the register that will get you. It has mini things. All the mini things. And I love mini things. So who's going to be visiting Rituals? Trust me, you're going to love it in there! I think candles are the perfect gift for someone you know, someone you don't know, someone you know but don't particularly like and also for yourself. Self gifting is totally allowed this month. I don't make the rules. And as much as I like to abide by this ethos, buying myself a fancy schmancy candle rarely actually happens. Now I'll buy a stranger a spendy candle without a second thought, so I need to cop on! So if you're feeling like you want to treat yourself this Christmas, or your loved one hasn't a notion what to get you this year, then send them this blog post and everyone will be happy. And if lighting a gorgeous candle on a cosy night doesn't make you happy, then I'm at a loss. There's no hope for you. So maybe one of these beauts will tickle your fancy this Christmas! You know when people say ooh this smells like Christmas? Well the Joyful Glow candle from Elemis really does. Well, it doesn't smell like the Christmasses we had growing up with fake trees and all the tinsel and those metallic garlands that we had attached to the ceiling with thumbtacks, four going from the "big light" out to the corners of the room. Ah good times... No this smells like the cinnamon Christmasses we used to see on the telly, with notes of vanilla and orange. It smells cosy, it makes me want twinkly lights everywhere and I'm just short of making a gingerbread house from scratch even though I can't bake, that's now much this smells like Christmas. And while I'm saving this for Christmas actual Day this year, when I went to the festive showcase a couple of months ago, they had it lighting and the glow that comes through all of those tiny bows is only dotey. The YonKa Quintessence Candle smells like relaxation station across the nation and as this burns, you get to enjoy YonKa's exclusive blend of essential oils - lavender, geranium, rosemary, cypress and thyme as they waft through the air, just what's needed during the busy month that is December. One of my missions for next year is to go to a YonKa spa, so until that happens, I'll light this candle, lie down and close my eyes and pretend I'm in one, while we all know I'll be lying on the bed in my fleece with the hun bun high. Yas! Is it really Christmas if you don't have a vanilla scented candle in your collection? Well this Gousse De Vanille candle from Irish brand La Bougie has a mix of tonka bean, orchid, cider and cinnamon and yes, it smells as delicious as it sounds. I find pure vanilla scented things can be too sweet for me, but this is just so aromatic and has a hit of warm spice thanks to the cider and cinnamon. I've written about the Sage & Bitter Orange candle years ago and the Sweet Pea & Pear candle back in 2012, which they don't make anymore, awww. This will be lit in the lead up to Christmas and all will be well in the world. I defy you to light this in the evening and not want to face plant the couch. That's how relaxing the Waxperts lavender candle is. Lovely Mammy Bits is as obsessed with it as I am and it's a candle I reach for to light when I've had a mad day, when I just want to switch off and unplug from social media and do what they call in the business, relax the kax. This candle, a cosy Christmas film and my fleece blanket and I'm a happy bridie. Ok add a glass of wine and nothing can make me want to leave the house! I really didn't think I was cool enough for the brand Le Labo which launched into The Loop in Dublin Airport this year. 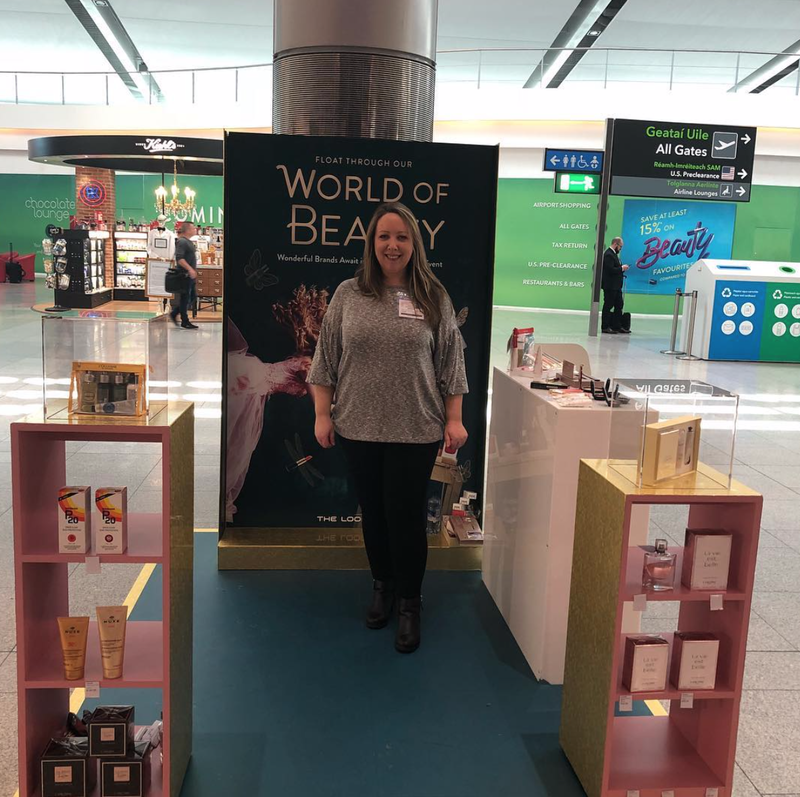 When I was in the airport during the summer, I had a look and a smell of lots of the products, got overwhelmed and didn't know what I wanted! 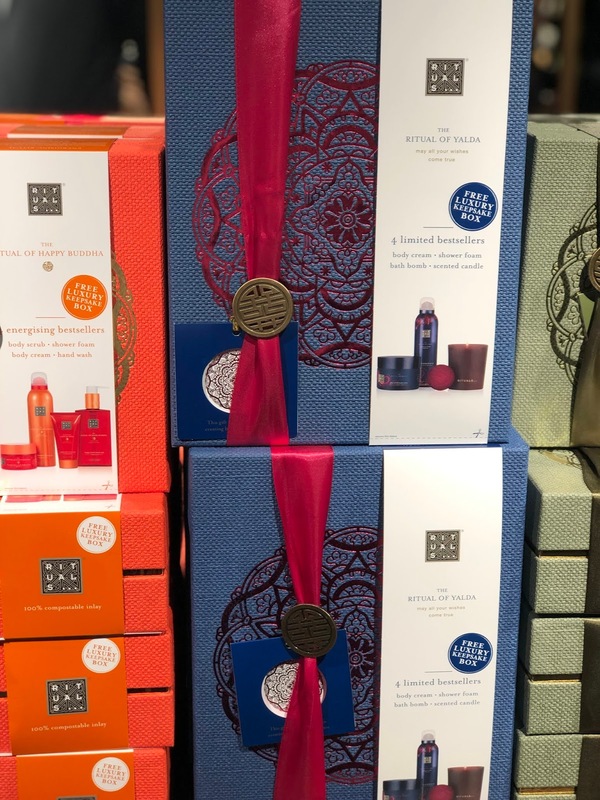 There's very much a cool New York vibe about the counter and the packaging itself too, with chic typed labels on the candles and fragrances, which you can get customised while you wait. I am not chic, but I feel less not chic now that I have the woody scent of my Laurier 62 candle which I got at The Loop Christmas event last week. With 62 ingredients in it, it's so hard to pinpoint what it smells like exactly, but I get woody winter wonderland vibes from it. It's definitely a winter candle that's full of cosiness and I can't wait to burn it this Christmas! Ok this is a bit of a cheat because I bought this in Home Sense a few weeks ago, but I wanted to include it for a few reasons. 1. It's a mix of two of my favourite scents ever - wood and lavender. 2. It was under the tenner mark. 3. Home Sense has their candles colour coordinated and that just makes me happy. They've always a load of Sand + Fog candles when I head in and it's just a matter of whittling down the ones you love. But while you might not be able to find this exact candle, I wanted to give you ideas that you can get some beautiful candles on a budget that don't begin with Y and end in ankee. Trust me. We're rarely without a candle lighting in the living room in the evenings, all year round. They're such a nice treat, so why not treat yo'self this year! What's your favourite candle? Go on, influence me! 'Tis the season and while I'm knee deep in glitter, twinkly lights and Christmas music, I thought it was time to get back blogging and bring you some Christmas gift sets! Now sets are a great gift, for yourself and also for a loved one and also for someone you don't know that well but are obliged to get something or else there'll be killin's. Joanne and I filmed a video featuring some of these sets, but for those who don't have time to watch Youtube, I thought this would be handier for you, but I'll leave the video at the bottom of the post if you want to take a look at us acting the maggot! I'll update this post throughout December if I come across any other gift sets that I think you might be interested in when I'm out and about, so pop back next week and see. But for now, let's get stuck in shall we? The Image Skincare Hydrate & Radiate set is aimed at those who need hydration, obvs, and if you need a bit of radiance too. Sure who doesn't need both of those things? I've used and loved all three of these products and think its such a gorgeous set with the Vital C Hydrating Anti-Aging Serum, the Vital C Hydrating Facial Cleanser (one of my all time favourite cleansers) and the Prevention+ Daily Ultimate Protection moisturiser SPF 50 and they all come inside a lovely wash bag too. These last for ages so it's a great investment skincare set and is available in Image salons nationwide. The Image Age Defying Essentials Gift Set is for those who want to tackle the signs of aging and while I haven't tried the Vital C Hydrating Repair Cream yet, I've used and loved the Ageless Total Pure Hyaluronic Filler and the Ageless Total Facial Cleanser lots. The cleanser exfoliates my skin gently while the Hyaluronic Filler adds moisture into the skin, giving a grand aul plumping effect. Gotta keep my fine lines a bit plumped don't ya know. For a more budget friendly skincare set for those who'd love a few anti-aging treats for their skin, the Trilogy Brilliantly Boosted Gift Set is definitely worth checking out. It has a full size Age Proof CoQ10 Booster Oil that boosts skin recovery and radiance, along with two travel friendly products too - the Active Enzyme Cleansing Cream and the Age Proof Replenishing Night Cream. I'm a huge fan of the Rosehip oils from Trilogy so I'm looking forward to giving these a go! You can buy it on the Cloud 10 Beauty website and Trilogy have a great selection of sets for all skin types. Pestle and Mortar is a brand I only got to know this year and so far, I've fallen in love with it, so when they gave me the All I Want For Christmas set, I was so excited to give them a go. The set has two full sized products, the Pure Hyaluronic Serum, their hero product, and the Recover Eye Cream along with two very generous midi-sized products of the Balance Facial Spritz and the Hydrate Lightweight Moisturiser. You can buy the set on their website or add it to your wish list! 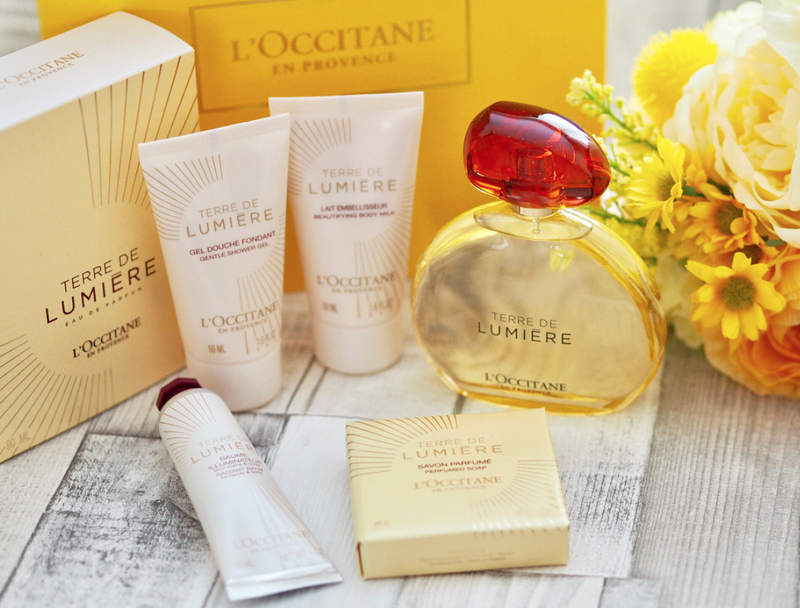 I did a collab with L'Occitane on Instagram with this gift set and while being a part of this post isn't part of the collab, I just wanted to highlight it for transparency. This is the Best Of L'Occitane Gift Set and I love it because you get some of L'Occitane's best selling products and if you're unsure as to what someone's skin type is and don't know if they'd like a certain serum or moisturiser, body products are generally a safer option for gifting (unless you've been instructed by someone who knows what they want!) And as well, €15 from the sale of each of the Best of L'Occitane Gift Sets goes directly to UNICEF, so as their hashtag says, it's #notjustagift. It's available in stores and online. I don't think your skin can get enough hydration, well mine can't anyway, and the Hydration Gift Set from YonKa has a full sized Hydra No1 Creme, one I've been using for the last few months along with a mini Lotion YonKa and a mini Hydra No1 Masque. That mask has saved my face many a time so it's good to have a travel sized version now, and the products come in a beautiful La Vie En Rose blush pink makeup bag with gold hardware that I'm obsessed with! My Mam is obsessed with makeup bags and I know she'd love this one. You can buy the YonKa sets at your local salon which you can find on their website. Another Irish brand is Bia Beauty and they've got two gift sets available this Christmas. The Feed Your Face Gift Set is €48 and contains the Orange & Grapefruit Facial Exfoliant & Cleanser, the Stop The Clock Eye Gel and the Mellow Mandarin Moisturiser, all of which smell incredible and are made with the highest quality ingredients, something that's important to Tracey Ryan, the founder of Bia Beauty. The sets are available from the website and from stockists nationwide too. 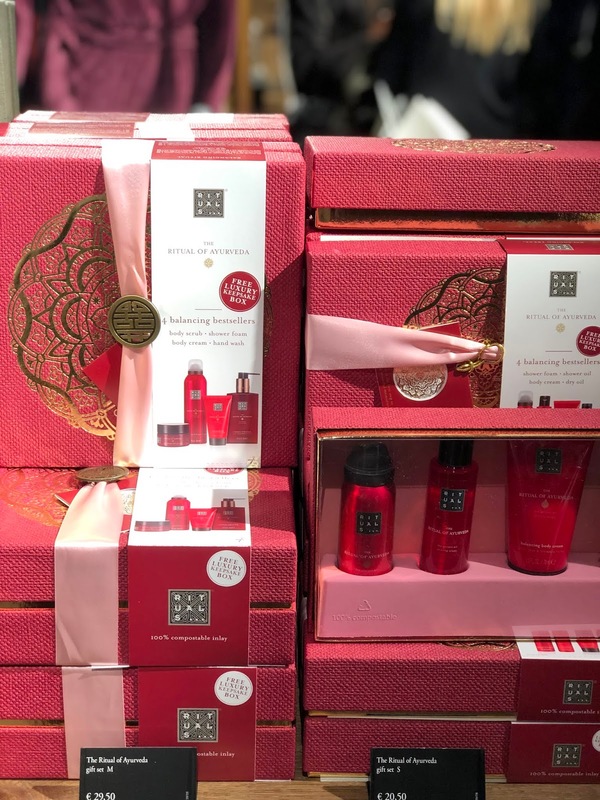 The Bia Beauty Helping Hands gift set is a good one for Secret Santa pressies, for the mother in law maybe or for someone that you want to get something lovely for but don't want to get them skincare. This has the Lemon Myrtle Hand Wash and Hand Lotion and I'd say those who love being out in the garden would love this too. They've a really bright, fresh scent and would look so colourful in a bathroom too. I love using some gorgeous skincare in the morning and feel and look refreshed and ready for the day ahead. The Morning Greeting Face Care Set from Dr Hauschka has the Rose Day Cream, the Cleansing Cream and the Facial Toner, something I've been spritzing all over me like a good thing. Dr Hauschka is a brand I reach for when I want to really treat my skin to gorgeous ingredients and in the past, I'd usually think of it when looking for gifts for my Mam, but over the last few years, that's changed and either I've copped on or I'm now I'm of that age. Shut up you....! I've loved Kinvara for years now and loved the new packaging that they brought out a while back. It's so colourful! The Glow Getter Gift Set contains two full sized products, one of which being the Elemental Exfoliating Powder, which sounds very intriguing altogether. I stopped using physical exfoliants a while ago as they were too gritty on my skin and have been using chemical exfoliants instead, but an exfoliating powder that has vitamins and minerals in it sounds right up my street. The other full sized product is the 24HR Rosehip Serum, one of my all time favourite serums ever which makes my skin feel plump and hydrated. And you get a free Hyaluronic Youth Boost in the set as well which can be used on targeted areas to plump the skin. Aimed at those with dry, sensitive skin, the Nutritic Gift Set is just deadly value. I've used so many of La Roche-Posay's products over the years and they're a brand I recommend to people all the time if they're on a budget but they want products that will work. Joanne is a big fan of the Nutritic range and this set has a micellar water, a thermal water and the Nutritic Moisturiser. It's available in pharmacies nationwide along with lots of their other sets. Another solid skincare brand that's great value is Vichy and they've a whole heap of gift sets available this Christmas. The LiftActiv Gift Set I was sent has the Purete Thermale 3 in 1 cleanser, but the sets I've seen online have a micellar water, so that's worth noting. The rest of the products are the same with the LiftActiv Supreme Day Care and a smaller LiftActiv Supreme Night Care along with a Thermal Spa Water. Like La Roche-Posay, Vichy is available in pharmacies nationwide. For haircare lovers, check out ELEVEN and its four Christmas sets available this year. I was sent the Hydrate Trio containing the Hydrate My Hair Moisture Shampoo & Conditioner which has silk amino acids and avocado oil to strengthen and hydrate hair. And it also has the Miracle Hair Treatment which Joanne has her eye on because it promises to add shine, control frizz, moisturise, detangle, protect against heat and that's only some of the claims! Watch our video below to see it in action!